Bobbi Beckwith had a dream. Last week, that dream became reality. 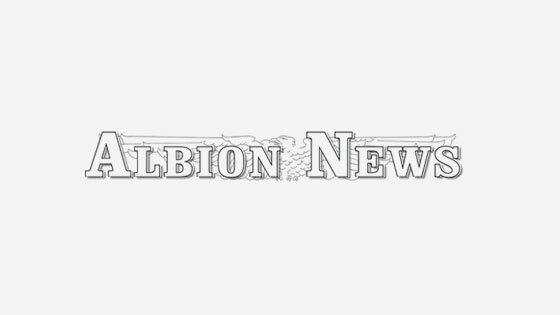 Bobbi, daughter of Chuck and Deb Beckwith of Albion, realized her goal of playing college basketball at the Division I level Wednesday, April 17, when she signed a Letter of Intent with Indiana State University of the Missouri Valley Conference. 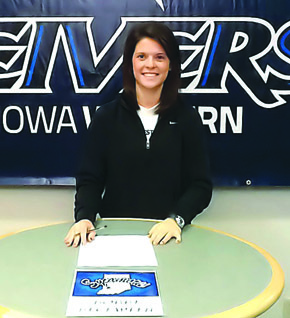 Beckwith, one of the most-decorated female athletes in Albion/Boone Central history, was one of 13 athletes at Iowa Western Community College in Council Bluffs, IA to sign with schools at the NCAA Division I level. Four of those were members of the Reivers’ 2012-13 women’s basketball team that posted a 24-6 record. Bobbi played for I.W.C.C. the past two seasons. She was the team’s starting point guard as a freshman, moving to the shooting guard position this past season and averaging 9.6 points, 2.5 rebounds, 1.8 assists and 1.5 steals per game. She was the Reivers’ best 3-point shooter, sinking 74-of-160 (46.2%). Bobbi received Academic All-Region honors both years. Her years at Iowa Western served as a bridge from small-class high school basketball in Nebraska to the opportunity of playing at the nation’s top level next year. Bobbi certainly has the glowing recommendation of Iowa Western Head Coach Jim Turgeon. “Bobbi’s one of the great success stories in what Iowa Western is all about. She was lightly recruited out of high school and came to Council Bluffs and worked hard to achieve her dream of playing Division I basketball. 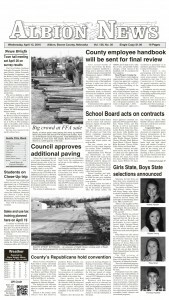 That comes as no surprise to area fans who watched Bobbi as a Boone Central Cardinal. Bobbi’s dedication to her goal, never wavering and settling for less than she believed possible, provides proof of the dividends such work ethic and talent can pay. Bobbi believes she is now ready for the tests at the next level. “I know the Missouri Valley Conference is really competitive. I think they said it is the ninth-best league in the country,” she said. “I’m really excited about that. Creighton’s always played in it, and I’ve always kind of watched Creighton. That school appears to have a program on the rise. Indiana State, led by third-year Coach Teri Moren, went 18-13 in 2012-13 – its highest win total since 2008-09 (19-11). The Sycamores finished 10-8 in the MVC and played in the Women’s Postseason National Invitation Tournament for the first time since 2005-06. Indiana State packed in an average of 2,592 fans per game at the Hulman Center – the 47th-best home game attendance total in the nation. The Sycamores have finished in the Top 50 in attendance the past eight years. For Bobbi Beckwith, last Wednesday’s commitment means her journey from small Nebraska high school to the brighter lights and bigger stage is nearly complete.